Bonterra Bees makes the world's best observation hives for sale. 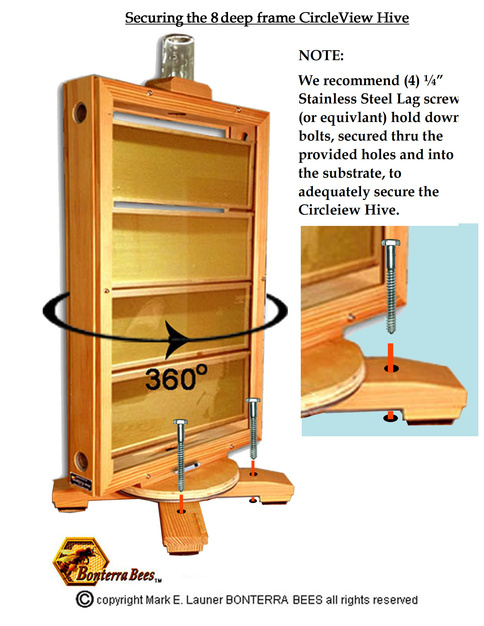 The CircleViewTM Observation Bee Hive brings the joy of the living natural world into your home and life. It is a unique home furnishing, an incredible observation hive design. Watch your bees while you have breakfast. Pour yourself another cup of coffee and study their morning industry. Watch and jot some notes; "the foragers are bringing in goldenrod pollen; the workers are storing it near the brood; the queen is laying steadily". This is a table model design, perfect for the den or family room, the kitchen or patio, or perhaps that special corner in your study or master bedroom. The CircleViewTM Observation Hive would also make a distinct and tasteful addition to your office, classroom, or reception area. The CircleViewTM Observation Hive includes a full-featured hive case, rotating base plate, outside entrance unit and through-wall pipe. Your honey bees will enter and exit through the rotating base plate to your clear or opaque routing pipe (not included), then through the wall to the outside entrance unit. To service the Observation Hive Case: close the hive case door and remove the case from the routing pipe, temporarily plug the routing pipe and remove the Case to the outdoors. This unit comes with instructions for creating your routing pipe from locally available inexpensive fittings. All models come with installation and hive management instructions. Note; Multiple frames of bees, comb and honey can be heavy, you may want help removing the hive case to the outdoors. Wax foundation, frames, bees and glass are not included. Please Note: Observation Hive Cases are presently shipped without glass. Please purchase glass locally. 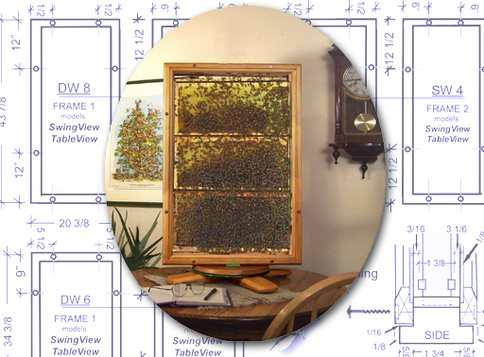 Simple installation instructions are included with the Hive Case, although we suggest that you take the glass frames to a glass vendor and have your glass vendor install and seal glass. For Public Exhibit Centers and areas with "out of control tonka trucks" we recommend 3/16" or 1/4" Laminated safety glass. Your order will be shipped in 14 days or less, allowing for assembly and order volume. All hive orders are shipped via UPS standard ground service. You will receive an e-mail notification and UPS tracking number when when your order is shipped. Hive Cases are notched for Langstroth style deep frames. To purchase go to our secure Shop page. For shipping charges to Alaska, Hawaii or Puerto Rico, please contact Tracey. We currently do not ship hives internationally. If you would like to purchase any of our products with a check , money order or purchase order, please contact Tracey. In your e-mail message, please include your shipping zip code and the model in which you are interested, as well any questions you might have. A Direct Order Blank with prices and product details will be sent to you via e-mail (or postal mail upon request).